Note: Frank's first wife is is his grandfather's granddaughter. In 1835 Matthias Skroch was born in Poppelau, Germany, of German Polish parents. In 1857 he was married to Anna Neva, who too was born in Poppelau, Germany in 1837. To this union were born three boys and five girls. Frank Skroch, our pioneer, being the third youngest of the family. Frank’s parents moved to the United States in 1839, when Frank was only three years old. Mr. and Mrs. Methious Skroch moved directly to Independence, Wisconsin as soon as they arrived in the United States, living there until their death. Mr. Methious Skroch died in 1898 and Mrs. Methious Skroch died in 1922, both died in Independence, Wisconsin. All during their lifetime, they were thrifty German farmers. Frank Skroch was born in Poppelau, Germany, November 28, 1865. At the age of three he came to America with his parents. Frank helped as best he could with all the farm work at home. In the spring of 1884, when Frank Skroch was nineteen years old, he bought his first class ticket for St. Paul, Minnesota. Instead of waiting to take the train as his ticket called for, he took the freight train, much against the will and wishes of the conductor, but since he had a first class ticket, he was entitled to ride on any of their trains and any way he choose to travel--his being the freight. Frank Skroch arrived in St. Paul the next morning at four o’clock. This was his first trip away from home alone and it was a great adventure for the young man. Frank had to wait in St. Paul until eight o’clock the same night for the next train to come along and bring him to Dakota, as our pioneer puts it, “It was the longest 16 hour wait I ever put in my life, it seemed weeks instead of hours.” before his train came. Just before the train pulled out of the St. Paul station, the sky was grey with clouds and it started to snow, the roads were piled high, some of the roads north of Jamestown were piled with snow as high as the roofs of the claim shanties. Frank Skroch was met at the depot in Jamestown by his Uncle Peter Skroch. Their Uncle had been living in this territory just a few months before Frank decided to come to Dakota. His Uncle took Frank Skroch out to the Seibert Farm, which is eight miles north of Jamestown. This farm is now owned by Morris Beck of this city. Frank Skroch worked on this farm until November of 1884 when he decided to return to Wisconsin for a visit. On March 4, 1885, he came back to Jamestown and decided to go back to the Seibert farm to work again, which he did. He stayed with Mr. Seibert until November of 1885 this time. When he had spare time he broke 15 acres of his own land which had been filed on Section 28-144-63; Mr. Skroch filed on this land in April of 1887. In April of 1887, Mr. Skroch brought a claim shanty from a nearby claim paying $30 for it. It was fourteen by sixteen feed in dimension. Mr. Skroch dug a nice basement the same size of the shanty, made a lean-to ten by sixteen, this was his first home in Dakota. As soon as Frank had his house built, he started to make a barn out of sod. All the farming equipment he had was one cow. 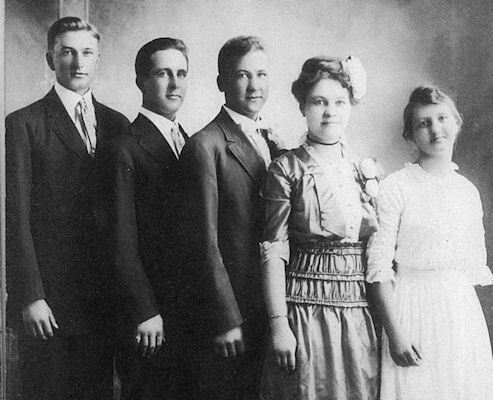 On November 27, 1887, Frank Skroch was united in marriage to Elizabeth Nogosek of Fried, North Dakota. [See Nogosek history document.] 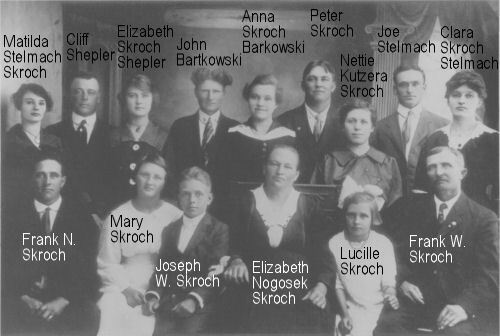 The Nogosek family had come to Dakota a few years before Frank Skroch did. All the Nogosek families settled out near Fried and were all of Polish nationality, settling in the Fried territory… [transcript unreadable ~27 characters] …Polish Catholic folk. The Polish Catholic religious worship in Germany-hence the small community of Fried was settled by Polish Catholic people. Fried is located eleven miles northeast of Jamestown, an inland town, no railroad has ever gone through Fried, there are stores and the Catholic school, cemetery and church in this little town of about fifty people. The first summer Mr. and Mrs. Skroch were Married, they lived with the parents of Mrs. Skroch. When they left for their new home, they were given a young heifer by her parents as a wedding present. Besides tilling his own land, Frank Skroch worked on the side for George Wright, running his threshing machine in the falloff the year from 1887-1894. With the kind assistance of George Seibert and his tools, Mr. Skroch was able to break up his own land. All the stock Mr. Seibert had was one cow, two oxen, and a team of horses. The oxen were never used for power on the farm, they were just used for meat. The oxen were staked out in the pasture all the time to eat so they would be nice and fat for butchering. In 1887, Frank Skroch had a very good crop of oats, he had 80 acres put in and the oats ran 80 bushels to the acre. The oats were the White Russian Oat-it never sold on the market, but was used for feeding purposes only. In 1888 Mr. Skroch had another good crop-this time it was of wheat, this wheat was sown on new land, running 40 bushels to the acre, all number one wheat, and sold at top price of 80 cents to one dollar per bushel. This wheat was very dirty, had a lot of wild buckwheat seed in it, with just a bit of time and patience this foul seed was removed and wheat was free of all impure seed. June 2, 1888, a boy by the name of Peter was born to Mr. and Mrs. Skroch. This son is living in Jamestown at the present time. March 16, 1890 a daughter by the name of Clara was born, she is now married and lives in St. Paul, Minnesota. Anne was born in 1892 on December 18, she is married to Mr. Barkoskie of Long Prairie, Minnesota. Frank Skroch was born on September 10, 1895, is living in Jamestown. Elizabeth is married to Mr. Shealar of Valley City, North Dakota, she was born on April 14, 1898. Mary, another daughter, was born February 14, 1901, she is married to Mr. Morris and lives in Janesville, Wisconsin. Joe Skroch was born January 10, 1906, he is now living in Jamestown. Lucille, the youngest of the family, married a Mr. Folk and is now living in Courtenay, North Dakota. She was born in 1908. Frank and Joe Skroch are both working for the Northern Pacific Railroad in Jamestown at the present time. 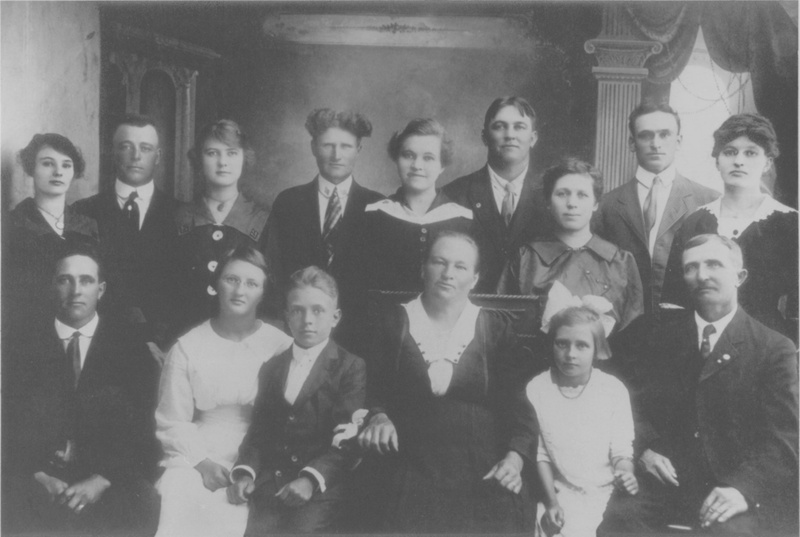 In the spring of 1919, Frank Skroch and his family left the farm and moved to Jamestown. In 1920, Mr. Skroch started to work for the Northern Pacific Railroad at the beginning of the strike. His first duties were as a guard over the lumber stock of the company. This lumber stock was located outside the picketed yards, which had a high board fence with two strands of barb wire at the top. To prevent violence to the railroad workers, they were given free board and room within this enclosure until the strike ended in 1921. Mr. Skroch was transferred into the round-house as engine helper; he worked there until he was pensioned by the railroad in 1935. At the present time he devotes his time to the care of his nice home on Lawrence Avenue, has a few chickens and is a devout Catholic. NOTE: Elizabeth is the daughter of Gregor Nogosek and Christina Skroch. See history of Joseph Nogosek. Chirstina is the daughter of Simon Skroch. Note: Joseph Stelmach is the sibling of Mathilda Grace Stelmach, who married Clara's brother Franklin George Skroch.